Conser Ltda. is a service company created because we saw the needs of shipping companies and their representatives in Bolivia as well as companies that are involved in foreign trade. Conser Ltda. opperates with four strategicly located Container Yards in the cities of La Paz, Santa Cruz, Cochabamba y Oruro where the largest volumes of import and export cargo are located. Actually most of the imports and exports are made using containers, which are property of the shipping companies. Conser Ltda.’s objective is to handle the containers that arrive with imports and provide containers for exports, facilitating operations both ways and giving shipphing companies peace of mind. It is very simple, Conser Ltda. has four Container Yards with security sistems, full insurance coverage, completely fenced, three Reachstackers, four forklifts, web based systems and all the requirements of a deport anywhere in the world, with an average loading or unloading of 5 minutes insuring proper handling, against 30 to 40 minutes that it actually takes with cranes that are not designed for this purpose and that many times can damage the container. One of Conser Ltda.’s strategic partners is A. J.Broom & Co. That has vast experience in Container yards, with presence in countries like Chile, Argentina, Perú and Ecuador,Colombia, etc.. Their knowledge and reputation in the field are with no doubta a great advantage that we have. What are the advantages for the Importer? They will benefit with the fact that they will not have to pay the transportation of the empty container back to port, they will simply deliver it in our depot and pay a Gate-ln fee that is a lot cheaper. What is the benefit for Shipping companies and their representatives? 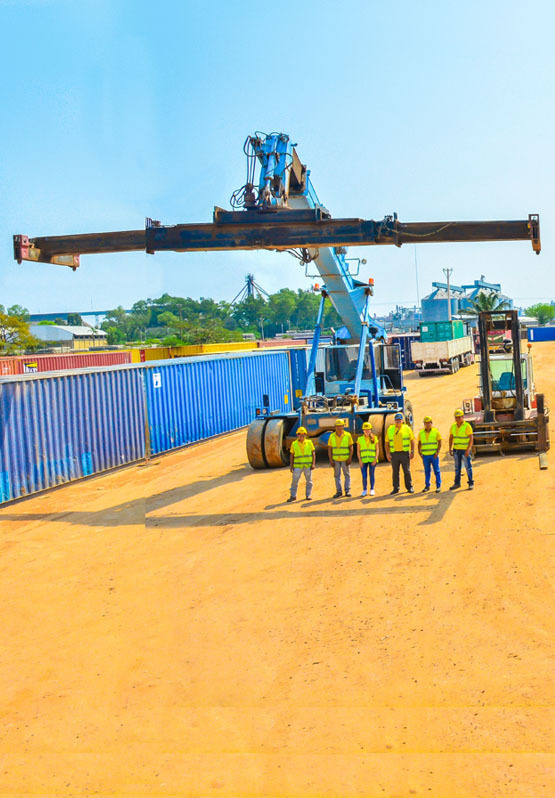 They are guaranteed that their containers are being handled correctly and that they have total control over them, since they will be able to know exactly the time and date of arrival an the time and date of departure, also that they will be servicesed according to their instructions. The trucking companies, since actually they have to leave a deposit as a guarantee for the return of the container in the same conditions that they received it. By delivering the container in our depots we notify inmediatelly to the shipping company that the container has arrived and that it was delivered in the same conditions specified in the EIR, so they can get their deposit back a lot faster. For all the reasons mentioned above, Conser Ltda. Is a company that will provide support to all the people and companies involved in foreign trade, assuring the coplete success of their operations.